The Grand Auditorium is an original Taylor design that was introduced in 1994. 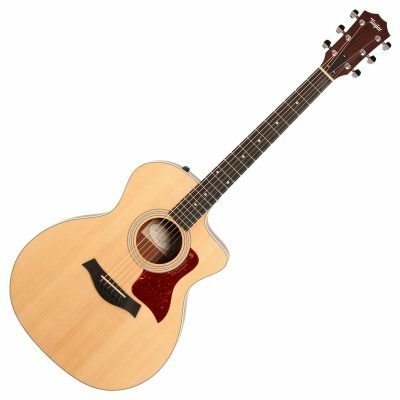 It is one of Taylor’s most popular and versatile body shapes, due to producing an original acoustic voice that is big enough to handle medium-strength picking and strumming. It features an impressive balance across the tonal spectrum, especially in the midrange, producing clear, well-defined notes that suited both strumming and fingerstyle playing. It is particularly an ideal choice for singer-songwriters who require a versatile instrument for composing and travelling with one guitar. 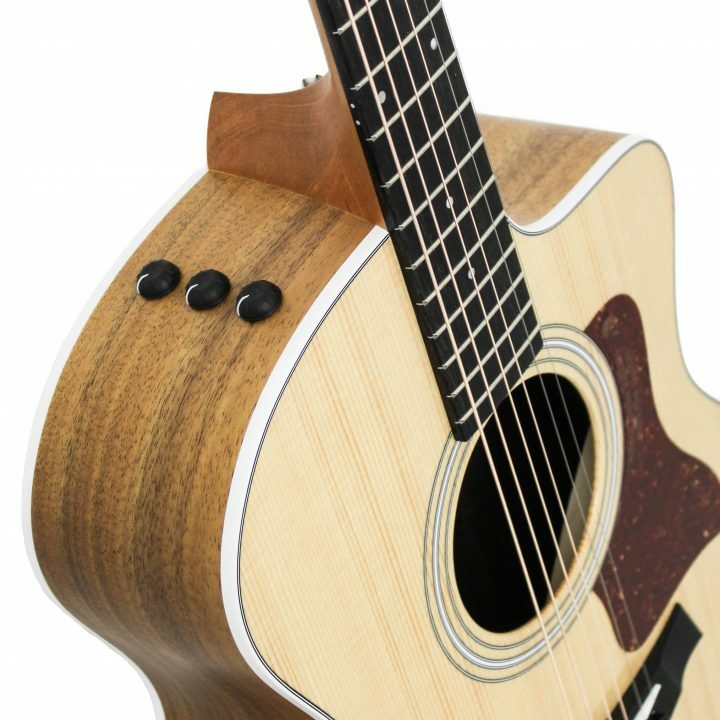 A significant factor behind the incredible sound of the Taylor 214ce Grand Auditorium Electro Acoustic Guitar is the forward shifted bracing pattern, which allows the tonewoods to vibrate naturally, creating incredible depth and complexity. The ‘x’ in the bracing pattern is moved closer to the soundhole, enabling more of the guitar top to vibrate, delivering maximum tonal quality and projection. The Venetian Cutaway is renowned for its soft, round lines, creating a visually stunning look that is recognisable on any body. This type of cutaway allows easier access to the upper frets for a comfortable play, and enables you with more freedom throughout the fingerboard. The 214ce Grand Auditorium Electro Acoustic Guitar is constructed with a sitka spruce soundboard, paired with a contrasting layered koa body. The Sitka Spruce top wood is one of the most commonly used wood for guitar tops. The combination of strength and elasticity translates into a broad dynamic range, providing crisp articulation and allowing for everything from aggressive strumming and flatpicking to fingerpicking. Perfect for all styles of guitar and players. Paired with layered koa veneers, players can achieve a climate resilient construction, perfect for travelling musicians. For added volume at larger events, the 214ce Grand Auditorium is equipped Taylor’s Expression System 2 electronics. This revolutionary pickup design features three uniquely positioned and individually calibrated pickup sensors, which enable a more dynamic range of acoustic sound to be captured than ever before. This high-quality system delivers a superb tone and responsiveness, either on stage, or even in the recording studio.